Like in the past guerrilla conflicts in Central America, where landmines caused havoc among combatants and civilians alike, Colombia has faced that same situation to devastating extent. 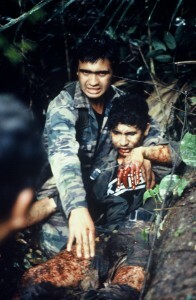 Here is a Guatemalan Army lieutenant seconds after being blown up by a guerrilla-laid landmine in 1985 in Peten province. © Photo by Steve Salisbury. All rights reserved. Colombian former president/now Senator Alvaro Uribe—a largely rightist hardliner whose support was a determining factor for Santos being elected president in 2010—is a fiery critic against these peace talks and feels betrayed by Santos, who was one of Uribe’s five defense ministers, on a number of issues since Santos took over the presidency. Uribe bitterly opposed Santos’ 2014 reelection. Constitutionally barred from running for a third presidential term due to term limits, Uribe and his rightist political opposition Centro Democratico party insist that if FARC and ELN leaders and members who Uribe says committed serious war crimes don’t accept sufficient, proportional jail time and prohibition from holding public office, then no peace accord should be signed with either the FARC or ELN. The FARC and ELN reject Uribe’s position as tantamount to asking for their surrender and question Uribe’s past for what they (and a number of others who are not guerrillas) say are his alleged links to the world of drug-trafficking and paramilitaries, which Uribe vehemently denies and says are smears against him. While Uribe acknowledges that his family had a friendship with the Ochoa family—whose brothers Jorge, Juan David and Fabio were convicted of being in the cocaine business with the late Pablo Escobar of the Medellin cartel—Uribe stresses that his family only had a mutual interest in horses or cattle and that it didn’t know at the time that the Ochoas were involved in drug-trafficking. “We cannot and shall not tell our own guerrillas that all of their blood and arduous sacrifice fighting for the people and the highest revolutionary goals is for only to surrender and go to jail. That’s absurd.” Ivan Marquez told me, as I recall. The FARC’s rank and file could end up lynching their own leaders, if they were told to surrender and go straight to prison. The way that the victims’/justice agreement is written, FARC members won’t go to jail if those who have committed serious war crimes confess fully and comply with alternative community-service sentences. Ironically, Uribe supported blanket amnesty for the now-defunct M-19 guerrilla group, which demobilized in 1990 and whose former members eventually formed political parties electing former M-19 guerrillas as mayor of Bogota, department governors, Congresspersons and council members. Uribe says that he has changed his mind about blanket amnesty because he has come to the conclusion that its impunity could foment future violence. However, some wonder if Uribe’s blaming the FARC for killing his father has anything to do with Uribe’s change of position. The FARC’s “Pablo Catatumbo” recently publicly denied that the FARC killed Uribe’s father, presuming circumstantial indications against that conclusion. FARC leaders had privately told me before that they weren’t sure if FARC troops did or didn’t kill Uribe’s father. Uribe’s brother Santiago was witness to events of the death of Uribe’s father and blames the FARC. But the FARC doesn’t deny having targeted Uribe in the past. During his first presidential campaign in 2002, Uribe narrowly survived a bus-bomb explosion against his motorcade in Barranquilla that killed at least four persons, and suspicion was cast on the FARC as being the prime suspect–though in Colombia it is often hard to know who is behind acts of violence. And Uribe’s presidency literally started with a bang. The FARC was attributed to firing home-made mortars at the Casa de Narino presidential palace and nearby Congress building on the day of Uribe’s presidential inauguration–about three rounds hitting the palace premises wounding some guards–and 13 people were reportedly killed and a couple of dozen wounded as landing projectiles burst blocks away. So, does Uribe think that the guerrillas can be completely wiped out? No. But Uribe is convinced that his policy of “democratic security” during his two presidential terms from 2002 to 2010 was breaking the back of the guerrillas, and he said that if Santos were to have continued it the way Uribe wanted and not “give away the country to terrorism” in Santos’ supposedly mishandling of peace talks, in Uribe’s view, then the FARC and ELN ranks would be substantially fewer, and their leaders would almost all be driven into exile in Venezuela or elsewhere. Uribe argues that Santos had let the FARC resurge militarily, politically and diplomatically. President Santos rejects this Uribe view. Santos insists that he has built on, expanded and strengthened Uribe’s defense policies and that the military and police during Santos’s presidency have struck the greatest blows against the FARC, killing the FARC’s then-maximum leader “Alfonso Cano,” top combat strategist “Mono Jojoy” and dozens of mid- to upper-level commanders, and that Santos was defense minister under Uribe for the controversial aerial bombing that killed FARC senior-level member “Raul Reyes” in a clandestine encampment just across the border in Ecuador. Uribe retorts that Uribe set the stage for the blows under Santos against the FARC’s “Mono Jojoy,” “Alfonso Cano,” and other FARC commanders. While Santos boasts that his military blows have been a crucial factor why the FARC is seated at the negotiation table, the FARC responds that it has always been open to peace talks and that just the fact that the FARC has survived the military onslaughts by Santos, Uribe and other Colombian presidents proves that the government cannot impose a military solution. Moreover, the FARC says that it was Pres. Santos who originally sounded the FARC out through a confidential intermediary or intermediaries to initiate peace talks shortly after Santos was inaugurated President in August 2010, although Santos says that the FARC secretly initiated the peace overtures. According to the Colombian think tank Corporacion Nuevo Arco Iris, which uses Defense Ministry figures, FARC war actions—including firefights, ambushes, harassment, sniper-fire, activated landmine fields, and attacks against the oil and energy infrastructure—spiked in 2002, coinciding with the end of Pastrana’s peace talks and Uribe’s assuming the presidency August 7 that year, to 2,063 from 825 in 2001. In 2004, that figure dropped to 949 and hovered a bit above 1,000 until 2008, when FARC actions rose to 1,353, and then to 1,614 in 2009, 1,947 in 2010 (Uribe left office August 7 that year), and 2,148 in 2011 during Santos’ first full year as president. It is important to note, however, that these FARC actions predominantly were small-scale and comprising largely of a change of tactics by the FARC to increase laying landmines as much as tenfold during a decade, say experts, and not of the same intensity or scope of FARC attacks from 1996 to 2002. In February 2015, Colombian government peace negotiator and former director of Colombia’s National Police, retired general Oscar Naranjo told El Tiempo newspaper that 688 of Colombia’s 1,101 “municipios” (a Colombian word more akin to counties) have some degree of landmines. While it wasn’t clear in Naranjo’s comments if these included landmines in “municipios” that no longer have FARC presence, that number represents 62.5% of Colombia’s “municipios,” greatly above the statistic of FARC presence given by Colombian then-Defense Minister Juan Carlos Pinzon in July 2012. Pinzon stated that while some 10 or 12 years earlier, guerrillas carried out violent actions in about half of Colombia’s “municipios,” that figure was about 37 predominantly rural “municipios” in 2012, affecting 4.6% of Colombia’s population. But according to think tank INDEPAZ the FARC in 2012 had a presence in 262 “municipios” in 28 of Colombia’s 32 departments. The FARC says it has a presence in all of Colombia’s departments. In the face of a more than doubling of Colombian Armed Forces’ personnel and the expansion, modernization and enhanced technology of the Colombian Armed Forces’ air mobility, naval capability, infantry, special forces, communications, intelligence, logistics, equipment, night vision, surveillance, electronic intercepts, targeting, firepower and smart-bombs, FARC leaders say the FARC had to readapt and go back to operating in small units (instead of massing light-battalion-sized formations for attacks), and rebuild and expand cells and networks of support in communities. The FARC sees this as a natural cycle of revolutionary struggle where military action is just one component, and overall not the most important one. What does the Colombian military say about the Uribe-Santos dispute on military status? Before the FARC’s unilateral “indefinite” cease-fires and the progress in the peace process, Colombian senior military officers told me that their orders and the rhythm of combat operations had been similar during both Uribe’s and Santos’ administrations. “We understand that Uribe is in a political campaign, and he is riding the pony that there has been a drop in security, but we are operating about the same as when he was president, and we continue to hit the guerrillas and other illegal groups hard,” said one high-ranking officer in 2014, who preferred to remain anonymous. That said, Uribe’s perception or misperception (depending on one’s optic) of Santos supposedly allowing guerrilla in-roads seemed to be once shared silently by a large part, if not predominantly, of active-duty military officers, and it still seems to be shared at a significant level, if not by the majority of officers. And this Uribe view appears to continue to carry large sympathy among retired military officers, though some retired generals have been working quietly behind the scenes to try to see how the peace process can be improved and strengthened, from their standpoint. Many in the military (active duty or retired) reminisce nostalgically of 2002 as what they see as a watershed year when Uribe entered to presidency and set in motion the highest intensity of Colombian military operations up to then, which led to driving main guerrilla forces further away from the cities (though a smattering of urban remnants remained), away from many rural traditional bastions, and deeper into jungle areas. Even so, Uribe’s steadfast rejection toward the current peace talks has cost Uribe some support inside the military, though it is hard to quantify. An Army retired combat enlisted man, who is hopeful for the peace process and says that many of his Army friends agree with him, told me, “It’s time to get this war over and move on. We’re tired of Uribe standing in the way.” However, Uribistas say that Uribe is standing in the way of a worse situation for Colombia and not in the way of a true peace.